Lama Nagpo Pema Wangchen, aka Lama Nagpo (Tib. བླ་མ་ནག་པོ་པདམ་དབང་ཆེན་, Wyl. 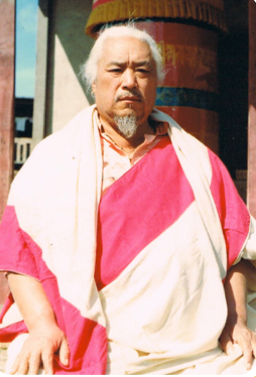 bla ma nag po padma dbang chen) was a renowned master of the Dudjom Tersar lineage from Bhutan, and a direct student of Dudjom Rinpoche. Lama Nagpo Pema Wangchen was born in Bhutan in the first half of the 20th. He received many teachings from Dudjom Rinpoche. In the early 1940s, Lama Nagpo Pema Wangchen laid the foundation for Chador Lhakhang, in Bhutan, to transmit the Dudjom Tersar tradition of his teacher Dudjom Rinpoche. After Lama Nagpo passed away, his disciple Lopön Nikula took charge of the monastery. In 1969, sponsored and organized by the Tsechu Association led by Golok Tulku, [Dudjom Rinpoche] gave empowerments and transmissions of the Kagyé Deshek Düpa, The Eight Herukas — Embodiement of All the Sugatas at old Ghoom monastery in Ghoom, Darjeeling, India. Attending were Minling Trichen Rinpoche, Dzongsar Khyentse Rinpoche, Dungse Thinley Norbu Rinpoche, as well as dakini Sangyum Rigdzin Wangmo, Dungse Shenphen Dawa Rinpoche, Nyoshul Khen Rinpoche, Sakya Khenchen Sangye Tendzin Rinpoche, Sera Gomde Rinpoche, Khachöd Rinpoche of Pema Yangtse Monastery in Sikkim, Lama Pema Longdrol, Lama Karpo and Lama Nagpo Pema Wangchen, Jetsün Kuzhok Pema, and Yogi Sönam Kazi, Ladakh Nono Rinpoche, Pema Wangyal Rinpoche, and may other great scholars, teachers, ngagpas, and men and women practitioners—thousands came, including Khenpo Tsewang Dongyal. Late 1977 through early 1978, Dudjom Rinpoche gave his last major teachings. The perfect place was Dudjom Gompa, Orgyen Dongak Chökhorling, the monastery of Dudjom Rinpoche in Boudnath, Nepal. […] The perfect teachings were the Dudjom Tersar cycle that included both his own and his previous incarnation Dudjom Lingpa’s teachings. The perfect retinue included such students as Trulshik Rinpoche, Dzongsar Khyentse Rinpoche, Palyul Choktrul [aka Chogtrul Rinpoche], Palri Kyabgön, Gangten Tulku Kuzang Namgyal, Lhalung Sungtrul, Dungse Thinley Norbu Rinpoche, Dungse Shenphen Dawa Rinpoche, Khenpo Tsöndrü, Khenpo Palden Sherab, Shar Khumbu Tengpoche Tulku, De-u Rinpoche, Tsang Gampa Gomchen, Dzatrul, Dragtrul, Nagtrul, Doshul Lama Gyalchog, Ladakh Nono, Ladakh Chhoje Rinpoche, Gyatrul Rinpoche, Yogi Lama Tsewang Lhagyal, Yogi Khetsün Zangpo Rinpoche, Mön Ngagchang Lama Karpo, Yogi Lama Nagpo Pema Wangchen, Lama Pema Longdrol and Lopön Nikula, and so forth, the great masters from the Nyingma School of Tibetan Buddhism. It included Khenchen Thrangu Rinpoche and Vakracharya Tenga Rinpoche, Digung Yudra Tulku, Kuzhok Tsechu, and Dazang Tulku, Bhutan’s Je Khenpo Kunleg, and Khenpo Khedrup and so forth, and a great many other masters from the practice lineage of the Kagyü School of Tibetan Bhuddhism. It included Kyabje Chogye Trichen Rinpoche, Traruk Rinpoche, Dhongthog Rinpoche, Khenpo Rinchen, and many others great masters from the Sakya School of Tibetan Buddhism. The retinue also included many others possessing the great wealth of the three trainings and of the realization of the two stages from among the assemblies, a total of over ten thousand devotees. Lama Pema Dorje Rinpoche, who received Tsa lung tikle teachings from him. ↑ Khenpo Tsewang Dongyal, Light of Fearless Indestructible Wisdom: The Life and Legacy of H.H. Dudjom Rinpoche (Ithaca: Snow Lion, 2008 p.132. ↑ Khenpo Tsewang Dongyal, Light of Fearless Indestructible Wisdom: The Life and Legacy of H.H. Dudjom Rinpoche (Ithaca: Snow Lion, 2008 p.140. This page was last edited on 3 April 2018, at 11:43.